Hay Season 2006 continues, and if all goes well, we'll be spending many, many hours today picking up hundreds of bales of hay before it starts to rain. We've already had a minor setback--nothing like picking up the two-way radio and hearing, "The rake is broken." But the Repair Crew (Joe, me, Cary, and the Nanny Bear) loaded up the Jeep with tools and a piece of chain Joe has held onto for 15 years (NEVER throw anything potentially useful out when you live on a farm in the middle of nowhere), bounced out into the field, and, as Joe put it, "hobbled the thing back together." Thank goodness. The tractor part store is about 70 miles away. They are open on Saturdays (you NEVER want anything to break down on a Sunday), but at this time of year the wait in line (which is full of anxious farmers glancing at their watches) probably exceeds an hour. It's definitely going to be a long, hot day, as temperatures are predicted in the 90sF. This is good for the hay, not so good for wilting hayers. Meanwhile, things are heating up in a totally different way over at Writings From Windridge Farm. Click here to read the latest chapter of my early farm adventures. Click here if you have no idea what this is all about. A year ago today I put up the first Daily Farm Photo, not knowing if I would be able to keep posting a photo every single day, or what people would even think of them. I've been astounded by their popularity. Click here to see the photo that started it all. And thank you for your wonderful comments and enthusiasm. It's been such a pleasure sharing my personal views of the farm with so many people from around the world. I -love- the daily photos! You have a keen eye for what will photograph well, which I envy .. not to mention adorable subjects! I can't wait to see each new photo ... thanks for sharing! Your BloG totally inspires me! Thanks ... the other Kary! The image of the farmers standing in line for tractor parts made me chuckle. Here it's the middle aged men with sunburns standing in line at the mower repair place with dinged blades and frayed belts in their hands talking on cell phones. "Daddy is busy now, I can't blow up the pool just yet." 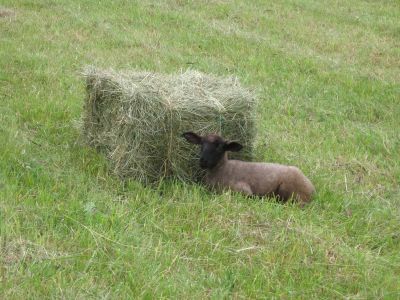 Susan - Congratulations on a year of Daily Farm Photos...! It makes my day, every day... By the way, I finally got a chance this morning to personally introduce my granddaughter Madi to Cary...she was enthralled, of course, in part because she is never far from her own little toy lambie (called BaBa). Another fan of Farmgirl Fare...! Oh great. A Watch Lamb! Well, I suppose it's formidable enough to ward off any creature inclined towards stealing hay? Love the daily photos. Just how many cameras have you gone through? I'm sure it's not easy to keep them clean while going about your daily grind. LOL, that is too funny. I love it. She is getting very big very fast! Thank you. Actually I'm only on my second camera. I've been using this one since December and I love it. Click here to go to a December Daily Farm Photo post that has a link to my camera on Amazon.com. I highly recommend this camera and know of one person who bought one recently for herself as a Mother's Day gift and is tickled with it, too. BTW, all the photos I post are taken on total AUTO setting and are not retouched in any way except for an occasional minor cropping (I don't do Photoshop). For under $200, I doubt you can beat it. I do tote my camera pretty much with me all the time, slung around my shoulder in a fairly well padded little case. I was just saying the other day that I'm so glad there are digital cameras because there is no way I could pack around my heavy 35mm camera everywhere I go.